U.S. equities finished higher Tuesday, posting their best one-day gain since September despite a ballistic missile launch by North Korea and an apparent breakdown in bipartisan budget talks. Bank stocks rallied sharply thanks to the passage of the GOP’s tax overhaul through the Senate Budget Committee — clearing the way for a vote by the whole chamber later this week. Also adding to sentiment in the stock market today was a comfortable reception to Federal Reserve governor Powell’s confirmation hearing to become the next Fed Board Chair. In the end, the Dow Jones Industrial Average gained 1.1%, the S&P 500 gained 1%, the Nasdaq Composite gained 0.5% and the Russell 2000 gained 1.5%. Treasury bonds were mixed, the dollar outperformed, gold was little changed and crude oil lost 0.2% after a joint OPEC, non-OPEC committee reportedly recommended extending last year’s supply cut agreement through the end of next year (with a review in June). 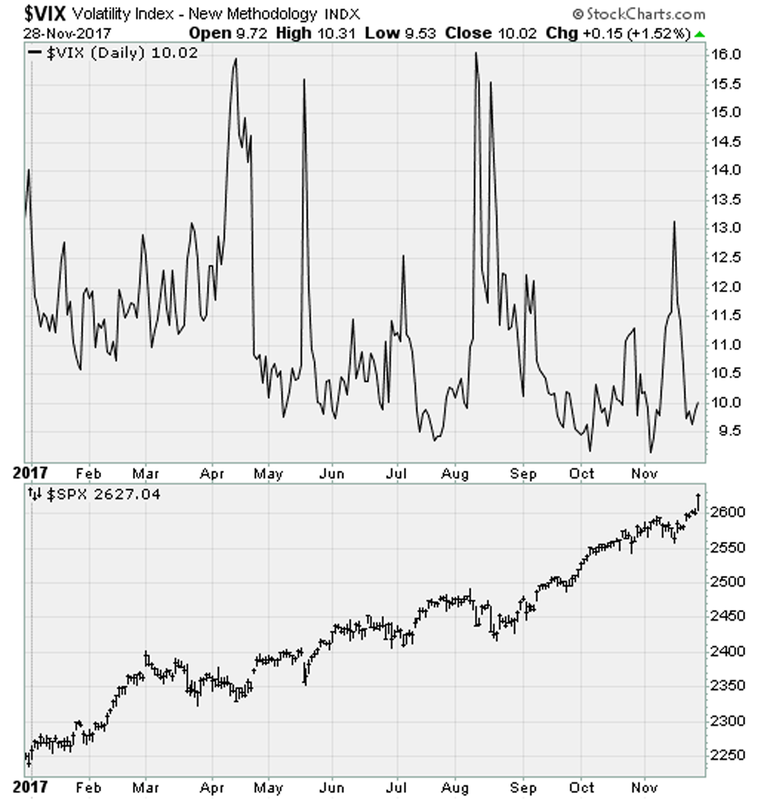 Click to Enlarge Breadth was heavily positive, with advancers outpacing decliners by a 2.2-to-1 ratio. 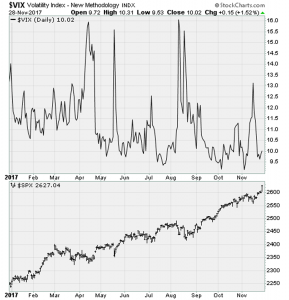 Volume was in-line with recent trends, as NYSE volume totaled 102% of the 30-day average. 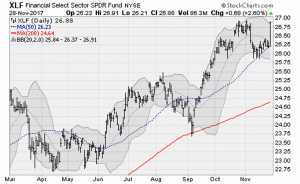 Financials led the way with a 2.6% gain while REITs were the laggards, down 0.3%. RV maker Thor Industries, Inc. (NYSE:THO) gained 13.3% on a big fiscal Q1 earnings beat with “towables” a bright spot. Buffalo Wild Wings (NASDAQ:BWLD) gained 6.3% after Arby’s (owned by Roark Capital) moved to acquire the company in a near-$3 billion deal. On the downside, Domino’s Pizza, Inc. (NYSE:DPZ) lost 1.3% after cautious comments by Longbow Research. On the economic front, the consumer confidence index increased for the fifth straight month to a new cycle high driven by labor market strength. Cyber Monday sales looked good. And the Case-Shiller home price index rose 0.5% month-over-month and was up 6.2% from last year amid climbing rental rates, low mortgage rates, and low housing inventory. Click to Enlarge Stocks pushed to new record highs — stretching already historic thin valuations even further amid an ongoing contraction in breadth — as objections to the GOP tax bill by Senators Ron Johnson (R-WI) and Bob Corker (R-TN) disappeared. But with a full Senate vote looming, the fate of the bill remains uncertain given wildcards like Senators John McCain (R-AZ) and Jeff Flake (R-AZ). Considering this — and the approach of another Federal Reserve rate hike this month — it’s not surprising that the CBOE Volatility Index actually crept higher today. That’s a sign that hedgers are moving into downside protection in case Congress can’t deliver a major policy victory on such a tight timetable. 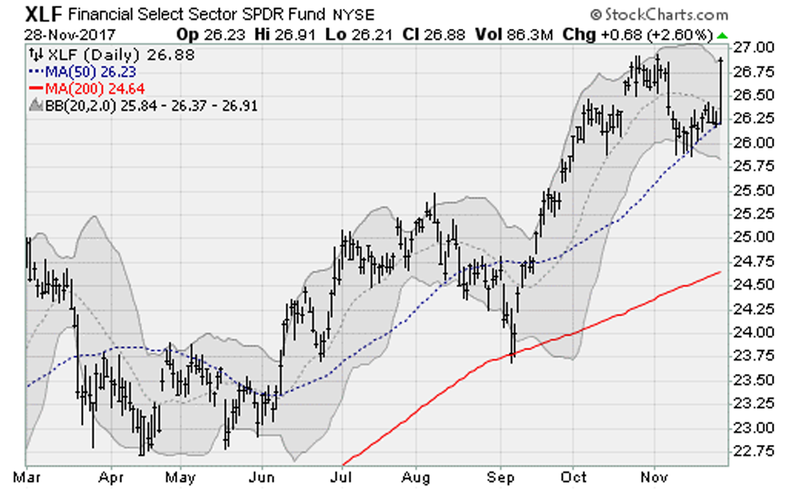 I recommended by Edge Pro subscribers play along, adding a December $31 call option position in the Short-Term VIX (NYSEARCA:VXX) fund. Check out Serge Berger’s Trade of the Day for Nov. 29. Article printed from InvestorPlace Media, https://investorplace.com/2017/11/stocks-surge-as-gop-tax-plan-clears-senate-hurdle/.